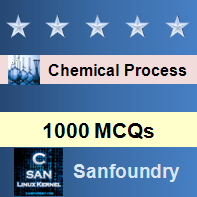 This set of Chemical Process Calculation Multiple Choice Questions & Answers (MCQs) focuses on “Flow Rate”. 1. Flow rate for a process stream is the rate at which material is transported through a carrying pipe. Explanation: Flow rate for a process stream is the rate at which material is transported through a carrying pipe. Explanation: Moles of a substance transported through a pipe per unit time is called molar flow rate. 3. ________ flow rate of a process stream is the mass transported through a pipe per unit time. Explanation: Mass flow rate of a process stream is the mass transported through a pipe per unit time. 4. Volumetric flow rate of a process stream is the ________ transported through the pipe per unit time. Explanation: Volumetric flow rate of a process stream is the volume transported through the pipe per unit time. 5. What is the molar flow rate of sodium solution if 80 gms of solution is collected in 20 seconds. Explanation: Molar flow rate = moles/time. 6. What is the mass flow rate of a material, if 20 ml of it is collected in 20 sec. The density of the material is 0.5 gm/ml. Explanation: Mass flow rate =Mass/time. 7. The velocity of water in a pipe of area 10 m2 is 5 m/s, what will be the flow rate of water? Explanation: Flow rate = Area*Velocity = 5*10 = 50 m3/s. 8. Mass flow rate of the liquid flowing through a pipe, 100 grams of the liquid was collected in 10 seconds? Explanation: mass flow rate = 0.1/ 10 = 0.01 kg/s. 9. Flow rate can be expressed as? Explanation: All a, b, c are the units of flow rate. Explanation: Volumetric flow rate = Volume/time.